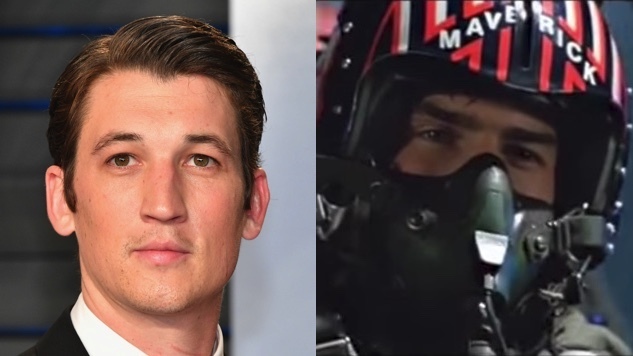 Whiplash star Miles Teller will take to the skies opposite Tom Cruise’s Maverick in Paramount and Skydance’s Top Gun 2, as Variety first reported. Teller beat out a host of young actors, including Nicholas Hoult of the X-Men franchise and Set It Up star Glen Powell, to land the role of Goose’s son and Maverick’s new protégé. Teller recently appeared in Joseph Kosinski’s Only the Brave, and will reunite with the Oblivion director for Top Gun 2, playing the descendant of Top Gun’s Goose, played by Anthony Edwards in the original film. Val Kilmer will reprise his Top Gun role in its follow-up, appearing once again as Maverick’s rival, Tom “Iceman” Kazansky. Jerry Bruckheimer, who produced the first Top Gun, will return to do the same for the second. Top Gun: Maverick, which began production in late May, is set for a July 12, 2019, release. Revisit a first-look photo from the shoot here and stay tuned for more on the movie.